Amandla Stenberg (born October 23, 1998) is an American actress. 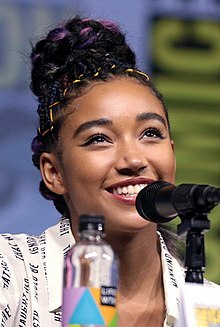 She portrayed Rue in The Hunger Games (2012), Madeline Whittier in Everything, Everything (2017), and Starr Carter in The Hate U Give (2018). Stenberg was born in Los Angeles, California, the child of Karen Brailsford, an African-American spiritual counselor and writer, and Tom Stenberg, who is Danish. Her paternal grandmother had Greenlandic Inuit ancestry. Stenberg has two older half-sisters on her father's side. Her first name means "power" or "strength" in the South African languages of IsiXhosa and Zulu. At the age of four, Stenberg started doing catalog modeling shoots for Disney. She has appeared in commercials for clients such as Boeing. In 2011, she appeared in her first feature film, Colombiana, as a younger version of Zoe Saldana's character. Her career breakthrough came when she was cast as Rue in the 2012 film The Hunger Games. She voiced Bia in the 2014 animated film Rio 2. Stenberg had a recurring role on season one of Sleepy Hollow. In 2015, she played series regular Halle Foster on Mr. Robinson. In 2013, Stenberg began performing on the violin and singing harmonies at Los Angeles venues with singer-songwriter Zander Hawley. They released their first EP in August 2015 as the folk-rock duo Honeywater. Dazed magazine named Stenberg "one of the most incendiary voices of her generation" when it featured her on its Autumn 2015 cover. She was also included in Time's list of Most Influential Teens in both 2015 and 2016, and named to Oprah Winfrey's SuperSoul 100 list of visionaries and influential leaders in 2016. Stenberg has spoken publicly on social media about cultural appropriation. Her video "Don't Cash Crop My Cornrows" admonished Kylie Jenner for adopting that traditionally African-American hairstyle. Stenberg co-wrote the comic book Niobe: She is Life with Sebastian Jones. The book is an offshoot of Jones' graphic novel The Untamed. It is set in a fantasy world and follows the journey of a half elf half human princess. According to Jones, it's the first nationally distributed comic that has a black woman as its protagonist while also having a black woman as the author and another as the artist. Jones wanted Stenberg's help in creating the comic because it revolved around a young female character. The first issue, illustrated by Ashley A. Woods, was published in November 2015. In May 2017 the pair released Niobe: She is Death, the second part of the trilogy. In 2017, she starred in the romantic drama Everything, Everything, directed by Stella Meghie, and co-starring Nick Robinson. She played the lead in Amma Asante's World War II drama Where Hands Touch, and the contemporary drama The Hate U Give (2018). Stenberg identifies as an intersectional feminist. She is outspoken about her political views in interviews and on social media, and was named "Feminist of the Year" in 2015 by the Ms. Foundation for Women. In 2016, Stenberg announced via Instagram that she would be attending film school at New York University. Stenberg identifies as non-binary, and uses both 'they' and 'she' pronouns. She has previously said she was bisexual and pansexual. In June 2018, in an interview with Wonderland magazine, she came out as gay. From 2017 to 2019, Stenberg dated singer King Princess. In a July 2017 interview Stenberg stated that she had stopped using a smartphone due to its effects on mental health, and took a long break from it. ^ "Biography- Amandla Stenberg" Archived October 9, 2014, at the Wayback Machine. amandlastenberg.com. Retrieved July 14, 2015. ^ Fogarty, Lisa. "Amandla Stenberg Is An Intelligent, Talented Force". bustle.com. Archived from the original on July 28, 2017. ^ "Colombiana in Mexico City". amandlastenberg.com. September 29, 2011. Archived from the original on March 31, 2012. ^ "Amandla Stenberg: "So excited to be playing Rue in The Hunger Games"". Hunger Games Network. Archived from the original on July 9, 2012. Retrieved March 28, 2012. ^ Martin, Michel (April 3, 2012). "Should Kids See 'The Hunger Games'". NPR. Archived from the original on December 3, 2013. Retrieved March 4, 2014. ^ "Svensk Hungerspelen Fansida". Hungergamesweden.blogg.se. Archived from the original on December 3, 2013. Retrieved March 4, 2012. ^ "Instagram". Instagram. April 11, 2014. Archived from the original on May 19, 2016. Retrieved May 6, 2016. ^ "Rookie » It's a New Wave: An Interview With Amandla Stenberg". Rookiemag.com. July 24, 2013. Archived from the original on June 3, 2016. Retrieved May 6, 2016. ^ "Amandla Means". Archived from the original on April 17, 2016. Retrieved April 20, 2016. ^ "Amandla's resume". amandlastenberg.com. Archived from the original on February 20, 2014. Retrieved March 4, 2014. ^ Jevon Phillips (September 23, 2011). "'Hunger Games' star on 'Colombiana' and life on the set". Los Angeles Times. Archived from the original on December 28, 2011. Retrieved March 15, 2012. ^ "'The Hunger Games' Pulls In Rue and Thresh". The Film Stage. April 18, 2011. Archived from the original on March 18, 2012. Retrieved February 21, 2012. ^ 20th Century Fox Film (February 22, 2013). "Twentieth Century Fox Animation Announces RIO 2 Casting". Business Wire. Archived from the original on June 30, 2009. ^ "Young, Gifted, and Black". BET. Archived from the original on May 8, 2016. Retrieved April 20, 2016. ^ Staff. "The 30 Most Influential Teens of 2015". Time. Archived from the original on September 21, 2017. Retrieved September 21, 2017. ^ Staff. "The 30 Most Influential Teens of 2016". Time. Archived from the original on September 23, 2017. Retrieved September 21, 2017. ^ "Meet the SuperSoul100: The World's Biggest Trailblazers in One Room". O Magazine. August 1, 2016. Retrieved July 5, 2018. ^ a b Grinberg, Emanuella (January 11, 2016). "'Hunger Games' star uses coming out as bisexual to promote #BlackGirlMagic". CNN. Archived from the original on April 15, 2016. Retrieved April 20, 2016. ^ "'Hunger Games' Star: "Don't Cash Crop My Cornrows"". NBC News. Archived from the original on October 13, 2017. Retrieved October 13, 2017. ^ a b Sanghani, Radhika (September 2, 2015). "Hunger Games actress Amandla Stenberg making 'badass' black feminist comic". The Telegraph. Archived from the original on May 8, 2016. Retrieved April 20, 2016. ^ Hennum, Shea. "For female heroes written by actual women, look beyond Marvel and DC". The A.V. Club. Archived from the original on December 1, 2017. Retrieved November 30, 2017. ^ "First Look at Amandla Stenberg's New Comic Book Niobe: She Is Death". Vogue. Archived from the original on October 13, 2017. Retrieved October 13, 2017. ^ Kit, Borys; Ford, Rebecca. "Amandla Stenberg, Nick Robinson to Star in 'Everything Everything' (Exclusive)". Archived from the original on July 20, 2016. Retrieved July 20, 2016. ^ "Amandla on Twitter". Archived from the original on May 10, 2018. Retrieved February 23, 2017. ^ Tartaglione, Nancy (April 11, 2016). "Amandla Stenberg In Talks For Amma Asante's 'Where Hands Touch'". Archived from the original on July 19, 2016. Retrieved July 20, 2016. ^ Barraclough, Leo (February 9, 2017). "First Look: Amandla Stenberg, George MacKay in Amma Asante's 'Where Hands Touch' (EXCLUSIVE)". Variety. Archived from the original on September 18, 2017. Retrieved October 13, 2017. ^ Amandla Stenberg (March 4, 2016). "@dazedfields and I are organizing a workshop on feminism". Tumblr. Archived from the original on March 5, 2016. Retrieved March 21, 2016. ^ Gupta, Prachi (December 16, 2015). "Amandla Stenberg and Rowan Blanchard Named Feminist Celebrities of the Year". Cosmopolitan. Archived from the original on April 19, 2016. Retrieved April 20, 2016. ^ Gray, Emma (December 17, 2015). "Amandla Stenberg & Rowan Blanchard Were Named Feminists Of The Year. Hell Yeah". Huffington Post. Archived from the original on May 30, 2016. Retrieved April 20, 2016. ^ "Instagram post by amandla • Feb 16, 2016 at 11:07pm UTC". Instagram. Archived from the original on May 10, 2018. Retrieved September 21, 2017. ^ "Amandla Stenberg Is a Voice for the Future". Vogue. Archived from the original on September 14, 2017. Retrieved September 21, 2017. ^ "Amandla Stenberg Is Headed to NYU". Essence.com. Archived from the original on September 21, 2017. Retrieved September 21, 2017. ^ Morgan, Joe (March 4, 2016). "Hunger Games actress says she 'doesn't feel like a woman all the time'". Gay Star New. Archived from the original on April 14, 2016. Retrieved April 20, 2016. ^ Stenberg, Amandla. "hi folks". Tumblr. Archived from the original on March 5, 2016. Retrieved April 20, 2016. ^ Chiu, Melody (April 20, 2017). "Amandla Stenberg: Why 'I Don't Necessarily Always Subscribe to Female Pronouns'". People Magazine. Retrieved July 29, 2018. ^ "so I took over the teen vogue snapchat today". Tumblr. January 8, 2016. Archived from the original on January 9, 2016. Retrieved January 8, 2016. ^ Guglielmi, Jodi (January 8, 2016). "Hunger Games Star Amandla Stenberg Comes Out as Bisexual: 'It's Deeply Bruising to Fight Against Your Identity'". People. Archived from the original on March 19, 2016. Retrieved April 1, 2016. ^ McCluskey, Megan (January 8, 2016). "Hunger Games Actress Amandla Stenberg Comes Out As Bisexual on Snapchat". Time. Archived from the original on March 30, 2016. Retrieved April 20, 2016. ^ Jeffs, Lotte (July 11, 2016). "Cover Star Amandla Stenberg Is Born To Rule". Elleuk.com. Archived from the original on August 12, 2016. Retrieved August 11, 2016. ^ "Hunger Games star Amandla Stenberg comes out as gay". PinkNews. Retrieved June 17, 2018. ^ "Hunger Games star and singer Amandla Stenberg comes out as gay". Gay Times. June 17, 2018. Retrieved June 17, 2018. ^ "Chartbreaker: King Princess On Working With Mark Ronson and Finishing Her Debut Album Within the Year". Billboard. Retrieved August 22, 2018.